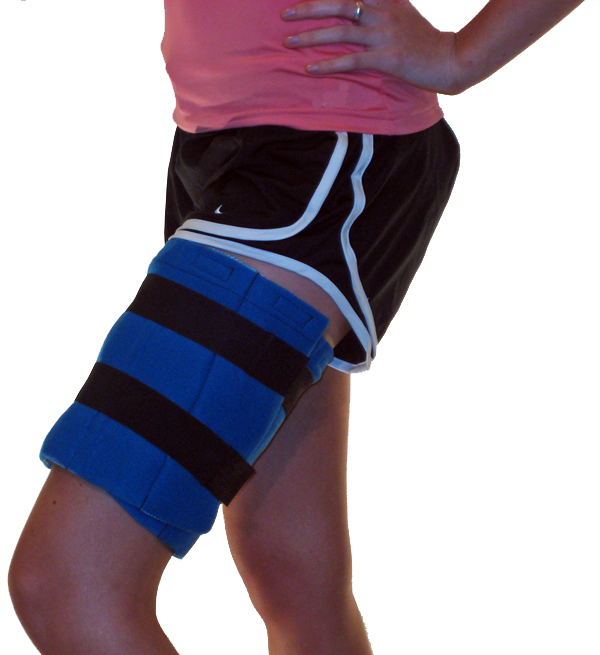 Universal Ice Wrap by Cool Relief: The universal ice wrap by Cool Relief offers injury relief to a variety of areas. With attached elastic straps and a bit larger coverage area than Cool Relief’s soft gel universal ice wrap, this product it geared more towards strains and sprains in the back, quads, and shins rather than household bumps and bruises. This universal ice wrap features a custom fitted double layer sheet of segmented ice pack inserts. The individual cubes connected into a sheet offer more comfortable support to the affected area than would a solid chunk of ice. This universal ice wrap offers a micromesh and foam sleeve with two attached 1” wide elastic adjustment straps for compression. Like all Cool Relief products it features interior focused icing technology. The micromesh material on the inside (or body side) is designed to safely direct cold towards the injury while the soft foam on the outer covering redirects the cold back into the wrap and towards the injury thorough the micromesh material. The elastic straps provide compression when wrapped around the injured area and affixed to the foam material. Built to last, the only wear and tear this item received in testing was a minor amount on the foam sleeve with the placement and removal of the Velcro attached to the elastic straps. For the price, this is a great product. In the middle of the price range for universal ice wraps, this product offers excellent coverage and support. Universal ice wraps are great all-purpose products. Cool Relief has built two excellent multipurpose wraps and this is the one is geared towards relief and from athletic injury. If you need recovery from different athletic injuries and don’t want to buy more than one type of wrap, this is the product for you.